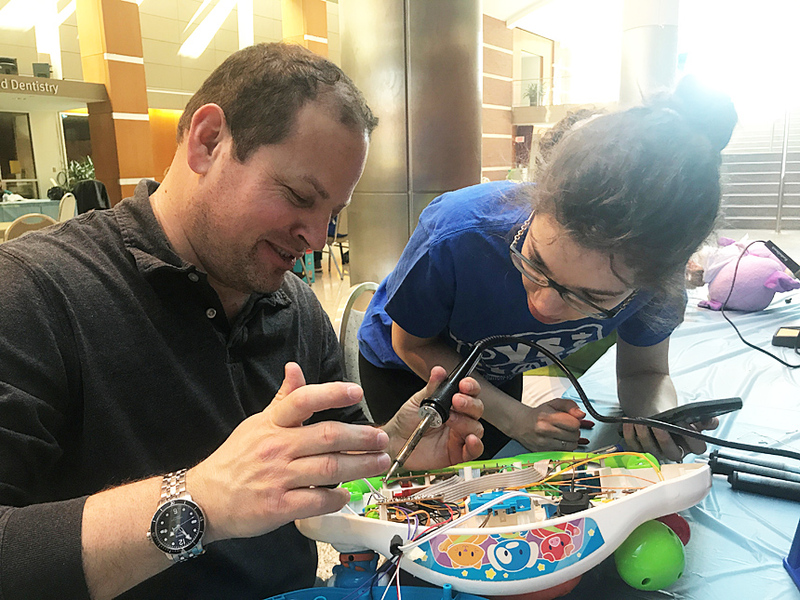 Liana Frangioni, a mechanical engineering major, looks on as Shai Shafrir, a mechanical engineering alumnus, solders wires into the circuit of his son’s favorite toy. Shafrir’s son has never been able to reach the left side of this multifunctional toy, which the adaptation will now make possible through this rewiring and attachment of an enabling switch. Jeneishka loves the Tickle Me Elmo that the University of Rochester Toys for All Tots program adapted to accommodate her special needs. She plays with it all the time, despite the cerebral palsy that severely limits her movements, says her mother, Shaneishka Rivera. Now, Rivera and Lydia Ortiz, Jeneishka’s grandmother, will be able to keep the two-year-old well supplied with toys. They were among parents of special needs children who learned how to adapt the toys on their own at a recent Toys for All Tots workshop at the University of Rochester Medical Center. The student project was spearheaded by Rachel Monfredo, lecturer and senior technical associate in chemical engineering, after she learned about Toys for All Tots at Ohio State University. Last fall, Mattel Inc. donated 28 toys, which students adapted with special switches, and then handed them out at a Medical Center clinic in January. That’s when Jeneishka first met Tickle Me Elmo. For the parent training workshop, Gary Smith—the Happy Pirate of the local Pirate Toy Fund—contributed another 20 toys. Eleven students turned out on a Sunday afternoon to help Monfredo set up and conduct the workshop. 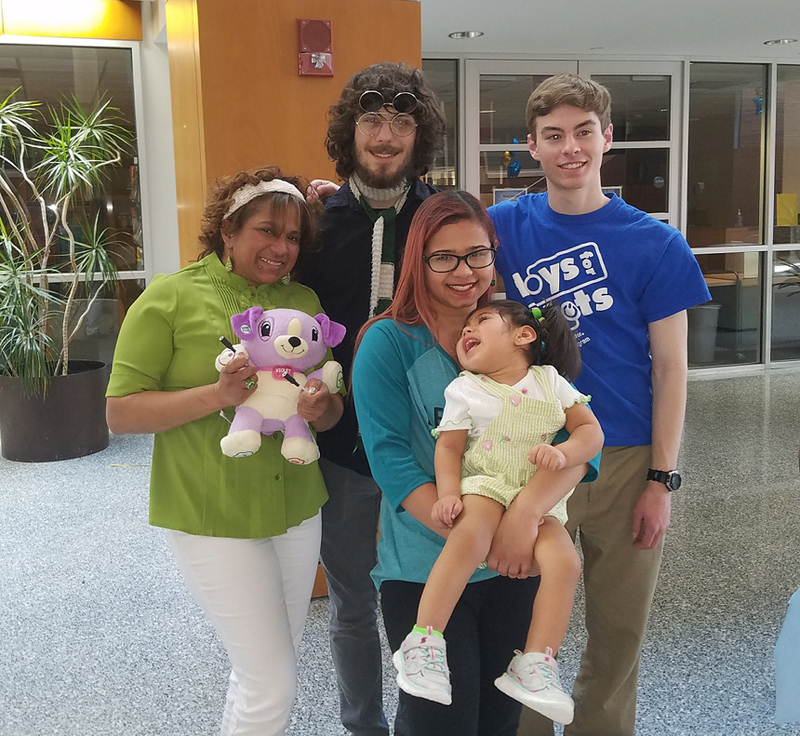 From left to right, Lydia Ortiz with the toy she adapted; David Vandermeer, a mechanical engineering major; Shaneishka and Jeneishka Rivera; and Paul Irving, a chemical engineering major.